Howlin' Wolf: Booming Voice Of The Blues His name was Chester Arthur Burnett, but everyone called him Howlin' Wolf. He played harmonica, but some say he was the greatest blues singer of all time. His unique voice mesmerized audiences and hugely influenced rock 'n' roll. 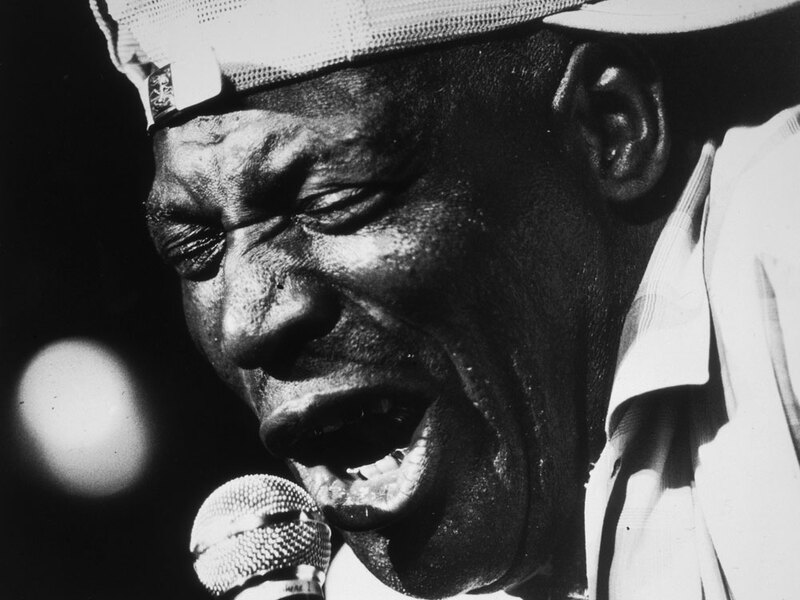 With his growling vocals, Howlin' Wolf fought his way to the top of the cutthroat Chicago blues scene. His name was Chester Arthur Burnett, but everyone called him Howlin' Wolf. He played harmonica, but some say he was the greatest blues singer of all time. His unique voice mesmerized audiences and hugely influenced rock 'n' roll. Nobody had a voice like Wolf, before or since. Singer and harmonica player Billy Boy Arnold says he remembers playing a bill with Wolf at Silvio's Lounge on a Saturday night in 1957. The lineup was a blues lovers' dream: Arnold's band, Muddy Waters and Howlin' Wolf. Arnold says he heard a lot of great blues singers in those days, but that there was never anyone or anything like Howlin' Wolf. "He had the most unusual voice in the history of blues," Arnold says. "That was his trademark. A lot a people tried to imitate him. But he just had that big, booming voice." Singer Ronnie Hawkins said it was "stronger than 40 acres of crushed garlic." Bonnie Raitt said he was "the scariest ... bit of male testosterone I've ever experienced." Legendary record producer Sam Phillips heard Wolf on the radio and said, "This is where the soul of man never dies." Maybe his guttural voice was a result of severe tonsillitis he had as a child. Or maybe Chester Burnett's travails had somehow come out in his voice. He was born a hundred years ago, black and destitute, in Clay County, Miss. -- cast out of his home, raised by an abusive uncle who whipped him with a leather plow line. He was so poor, he once tied burlap sacks around his bare feet, and so hungry he once ate food scraps tossed off a train by railroad workers. While he was a young man sharecropping in Mississippi, Wolf apprenticed with Delta blues legend Charley Patton. As he said on a Chess Records album in 1968, Wolf was deeply influenced by Patton's gritty singing and percussive playing. Wolf started playing on weekends in country juke joints, then moved to Memphis, made a name for himself and finally settled in Chicago to become -- literally -- a giant of the blues. "He was a big man, wore size 16 shoe," guitarist Jody Williams says, "and his stage presence -- when he talk or sing, people listen to him, you know." Williams played guitar alongside Hubert Sumlin in Wolf's band in 1954. Of all the famous musicians Williams backed up -- Bo Diddley, Memphis Slim, Big Joe Turner -- Wolf is the one he remembers best. "He even went outside the door of the club," he says. "He had a long, 100-foot cord on his microphone. So Hubert and rest of the band and I were onstage playing, and Wolf just howling and singing. So he went out that door, down the sidewalk to the corner, he [was] just blowing his harmonica and howlin' and carryin' on. But that was the Wolf." Mark Hoffman, co-author of Moanin' at Midnight: The Life and Times of Howlin' Wolf, paints a similar picture of the wild-man performer. "Wolf would crawl around on his hands and knees, and he'd howl like a wolf," he says. "He'd pound on the stage. And people would watch him; they couldn't take their eyes off him." With his feral stage presence and growling vocals, Wolf fought his way to the top of the cutthroat Chicago blues scene during the 1950s -- neck and neck with his rival, Muddy Waters. In the '60s, young white rockers discovered his music and began to cover his classic renditions of "Little Red Rooster" and "Spoonful." In 1965, The Rolling Stones, fresh from England, appeared on the ABC TV show Shindig. They had one condition: Their idol, Howlin' Wolf, had to be there, too. Sure enough, he was. A hulking black eminence, he stood at the microphone in a dark suit, his huge head sweating as he stabbed the air with his finger, shaking his hips salaciously before a bevy of white go-go dancers. It's surely one of the most incongruous moments in American pop music. Music journalist Peter Guralnick, who says he reveres Howlin' Wolf, goes even further. He calls it one of the greatest cultural moments of the 20th century. "What was so great about seeing Wolf on Shindig was it was in a sense reality imposing itself on this totally artificial setting," Guralnick says. "While I was a big fan of the Stones, it was altogether appropriate that they would be sitting at Wolf's feet. And that's what it represented. His music was not simply the foundation or the cornerstone; it was the most vital thing you could ever imagine." Since Chester Burnett died in 1976 -- in Chicago, the town that made the blues famous -- a postage stamp has had his face on it, and there's been a statue in his hometown, a blues festival in his name and numerous Hall of Fame inductions and record reissues. The Wolf keeps howlin'.